Growing up, I was a fully-armed child. I roamed the backyards of my Plymouth neighborhood with everything from cap pistols to plastic M16s to Laser Tag guns to -- my personal favorite -- the Entertech AK Centerfire rapid-shooting water rifle! They don't make em' like that anymore -- and with good reason. That watergun was the same color and approximate size of a real semiautomatic! 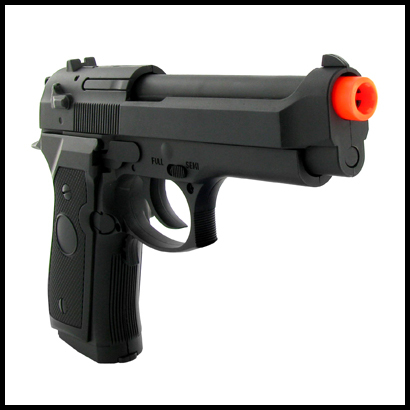 As Kevin Warwick of the Chicago Reader reminded in a blog post this weekend, the federal government enacted rules in 1988 that required manufacturers to affix blaze orange tips on the muzzles of all toy guns. Even with the law, toy guns still pose problems; an eighth-grader in Texas was shot and killed by police earlier this month when he refused to drop a realistic-looking pellet gun. Warwick's blog takes readers on the lighter and more nostalgic side of the issue by connecting us to toy gun television ads of the past 60 years. Below are a couple examples he unearthed -- one from the 60s and the other from the 80s. Check his blog out for the rest of the hilarious examples. Of course, I was shocked that a Chicago writer would neglect to post one toy gun ad from the past. Any child of the 80s who was a football fan would probably remember this one! Most of the guns sold in toy departments these days are obvious fakes. The squirt guns have oversized water tanks that are easy to spot and the Nerf dart guns have blaze orange all over them. Even so, I'm wondering if parents are uneasy about buying guns for kids in this post-Columbine world. Parents, post your thoughts in the comments below. Do you have any restrictions on whether your kids can play with toy guns?